I picked this up this Ostby Barton Master Mason ring at a local Pawn Shop a few years ago, and it's been sitting in my jewelry box for quite some time. I'd like to know why and what the cross like symbol is/mean that is stamped after OB 10K. And anything else you can tell me..how old it might be, is there a "degree" on this one? 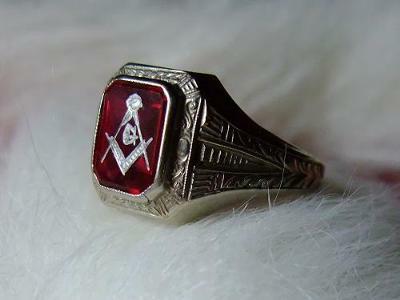 This is a Master Mason's ring. The Square and Compasses symbol on its face denotes that the man who wore it was a Master Mason. This means that he was initiated into the fraternity as an Entered Apprentice, which is the first degree; he passed to becoming a Fellowcraft, which is the second degree; and then became a Master Mason,which is the third degree. There is no higher degree in all Freemasonry than the third degree. 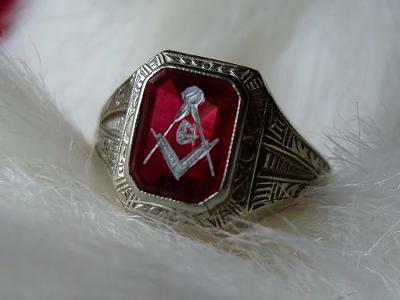 There are many lateral appendant bodies which provide additional learning, but by becoming a Master Mason, the owner of this ring believed in brotherly love, relief and truth. As to the cross which is engraved into the inside of the ring, this is a jeweler's hallmark. More interesting than the cross are the letters: 'OB'. This denotes that this ring is an Ostby Barton Masonic ring. 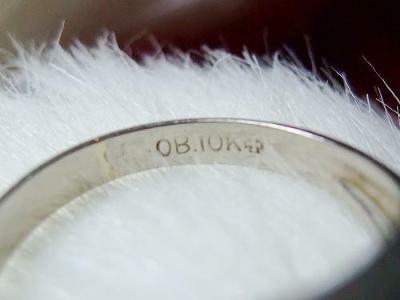 Ostby Barton ceased making Masonic rings sometime in the 1950s. For more information about Engelhart Cornelius Ostby, copy the link, below and place it into your browser's address bar to read more about why this ring is prized by many collectors. As to the value of the ring, I cannot say because I am not a jeweler. My best suggestion would be to view Ostby Barton Masonic rings on E-Bay to get an idea of your ring's worth. They are usually in high demand and retain their value, well. Thanks for sharing this beautiful Ostby Barton Master Mason ring with everyone. The OB does stand for Ostby & Barton. The center will have the number of carats in gold(10K,14K etc. )and if it's silver,it will have STERLING the OB, metal, and the Cross is actually a Maltese Cross they used as a maker's hallmark. Beware, from 1922 on, they allowed other jewelry makers to copy their designs and hallmark for a fee. I agree with most everyone in that as to value, there are two ways. One, have a reputable(I mean knowledgeable in ANTIQUE Jewelry) Pawn Broker, or several, look at it and give you a price, just don't pawn it! Two, find a reputable jewelry appraiser and have them appraise it. This will cost a little.